After the initial success of the Nikon 1 V1 and the somewhat uninspiring sequel the Nikon 1 V2, Nikon has introduced the most capable, and, arguably, the most stylish model of the system to date in the shape of the new Nikon 1 V3. Aimed unreservedly at enthusiasts looking to replace their high-end compacts, the Nikon 1 V3 boasts a new 18-Mpix CX format (1-inch type) CMOS with on-chip phase-detection (PD) AF pixels for improved AF operation and faster focusing than those adopting just contrast detection. This hybrid AF system boasts a total of 171 AF points, with 105 linked to the dedicated PD pixels on the sensor. A new Expeed 4A level processor is required to handle the increase in data allowing not only a ISO12,800 maximum sensitivity but also full HD 1080p video recording at 30/60fps and continuous stills shooting at the same rate. The Nikon 1 V3 can also boast continuous bursts up to 20 fps with full-time AF. Although the body no longer has a built-in electronic viewfinder, the V3 has a new 3.0″ 1,037k-dot tilting touchscreen LCD to the rear. However, if you prefer a viewfinder, the firm has announced an optional Electronic View Finder with 2,359k-dots and near 100% frame coverage. For additional stability and security, Nikon has also introduced an optional grip. It boasts angled controls for improved handing, like the firm’s DSLRs, and includes a third programmable function button and a sub-command wheel. In the US, the Nikon 1 V3 is bundled with the grip, EVF and new stabilized 1 Nikkor VR 10-30mm f3.5-5.6 PD-Zoom kit lens at around $1,200. 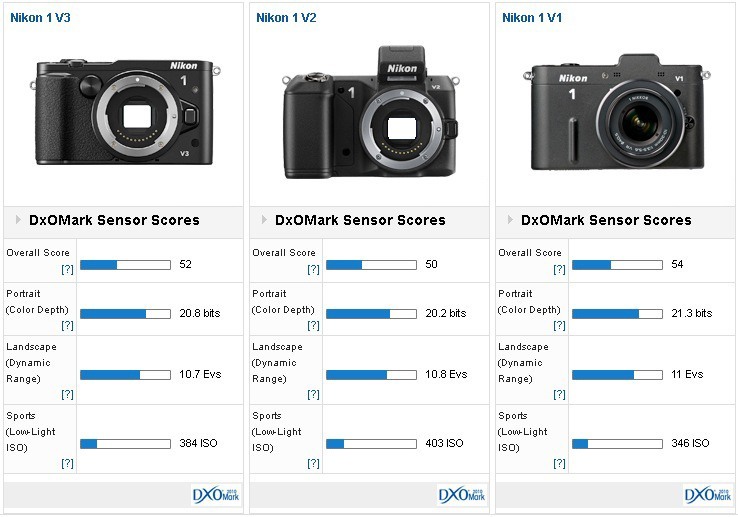 With a DxOMark a score of 52 points the new sensor in the Nikon 1 V3 performs well, proving yet again that an increase in pixel count doesn’t necessarily degrade performance. In fact as a sampling device, higher pixel counts are advantage. The 20.8 bits measured color sensitivity, dynamic range of 10.7 stops and 384 ISO scores are all-good for a sensor of this size and resolution. 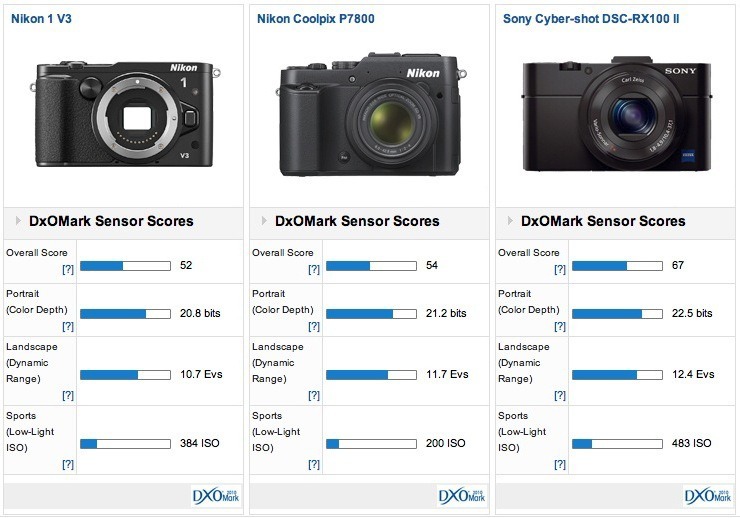 Equally, however, the scores are on the low side when comparing with the firm’s Coolpix P7800 compact and with larger Four Thirds and APS-C size sensors. Compared to this model’s predecessors, the 14-Mpix V2 and the 10-Mpix V1, Nikon has managed to maintain similar color depth and dynamic range while also preserving the low-light capabilities, for what they are. In fact, the increase in pixel count and plethora of on-chip PD-AF pixels has had little effect on low light performance. As a flagship model the Nikon 1 V3 is aimed at enthusiasts looking to complement other camera formats, perhaps even replacing high-end compacts with only a small penalty in weight and size for the flexibility of interchangeable lenses. 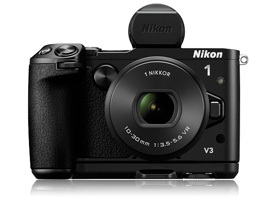 This is where the V3 should shine but at $1,200 it looks expensive and the larger sensor can’t match the 12-Mpix Nikon Coolpix P7800’s sensor for color discrimination or dynamic range. Like the Coolpix, the Sony Cyber-shot DSC-RX100 II adopts a fixed zoom but it has the same size sensor as the Nikon 1 V3. 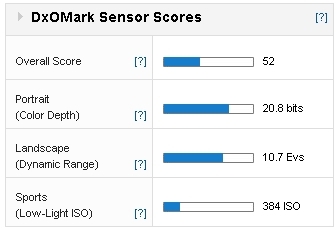 It also has a 20-Mpix resolution and is the sensor to beat with a DxOMark score of 67 points. Unfortunately, the Nikon 1 V3 lags behind, presumably adopting a different sensor vendor, and with slightly different design objectives – the fast AF is one of the most attractive features of the Nikon 1 system. 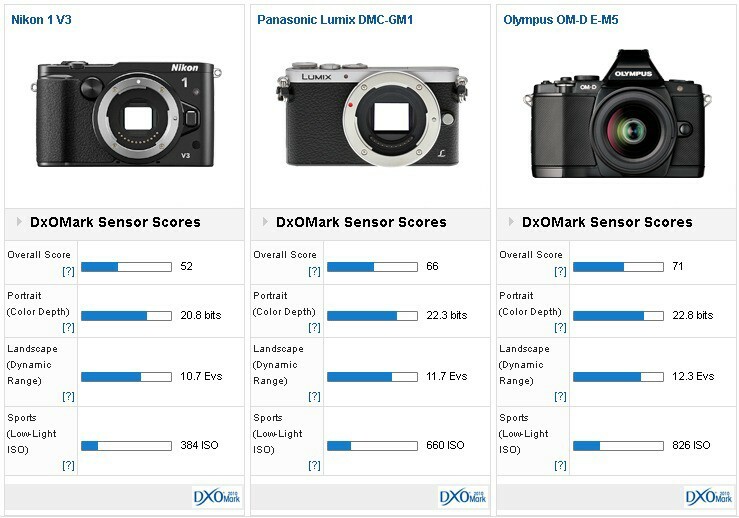 Nikon 1 V3 Versus Panasonic Lumix DMC-GM1 Versus Olympus OM-D E-M5: Serious challenger? Pitched against models with larger sensors, in this instance Four Thirds, the Nikon 1 V3 sensor fails to really excite. The 16-Mpix Panasonic Lumix GM-1 can’t quite match the pixel count but it’s actually smaller and lighter and more sensitively priced. Sensor performance is very good compared to the Nikon. It has better color sensitivity, an extra stop in dynamic range and around a +0.5 stop improvement in low light sensitivity. At $999 body only you opt for the Olympus OM-D E-M5. It’s a little heavier but it has a built-in EVF, not to mention the very effective in-body 5-axis stabilization and an even better performing sensor than the diminutive Panasonic. It has more reliably distinguishable color, +1.5 stop wider dynamic range and around a +1 stop gain in low light sensitivity. While the sharp-styling and contemporary design of the Nikon 1 V3 is distinctive, Nikon has yet to match the Sony sourced 1-inch sensors in performance. Nevertheless, Sony has yet to introduce any models featuring that sensor with interchangeable lenses, and the Nikon 1 V3 remains appealing from that perspective. Few can argue that the Nikon is not inexpensive. It may be aimed at enthusiasts but the sensor’s imaging performance falls short of more accessibly priced rivals. While it isn’t bad exactly, it’s not at the cutting-edge of rivals but then they can’t match the Nikon 1 V3’s phenomenal burst rates or remarkable AF capabilities.